[Achu Wilson] was watching TV when he saw an ad for Volkswagen’s latest Passat, which happens to come equipped with a park assist mode. This essentially allows the car to park itself with little to no user interaction. While these systems come as a pricey add-on option, he figured he could build something similar in his own home, albeit on a much smaller scale. Digging through his parts bin he only came across a single infrared proximity sensor, so instead of building vehicle that could parallel park, he settled on constructing one that can situate itself in a traditional parking spot instead. 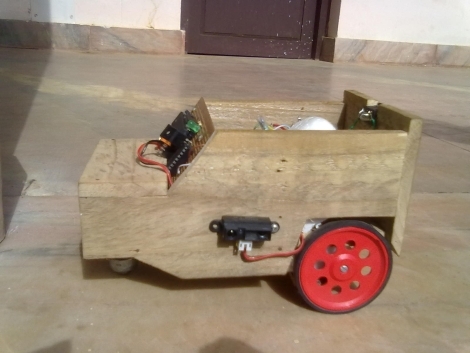 The car is built from wood and a pair of DC motors [Achu] had on hand, both of which are controlled using an ATmega16. As a proof of concept, it looks to work pretty well despite the fact that it only has a single fixed sensor navigate its surroundings. We imagine it would be a relatively easy task to adapt the system for parallel parking, among other things. Continue reading to see [Achu’s] self-parking car in action. [Milton] sent in a build that censors every ‘F’ word on TV, and not just the one that rhymes with ‘duck,’ either. His setup sounds the alarm every time someone inside the moving picture box says a word that contains the letter F.
The build is based around Nootropic Design’s Video Experimenter Shield. This neat little shield has been used as a video sampler and has analyzed what the talking heads are actually saying. The Video Experimenter Shield has support for closed captions, meaning a transcript from a TV show can be read in real-time. All [Milton] had to do so the ‘F word’ alarm could be sounded was strchr(). The F-Chip, as [Milton] calls his build, includes three outputs – a solenoid sounds a bicycle horn, sends some air through a whistle, and lights up an ‘F-word’ alarm. From the video of the F-Chip in action (available after the break), we can tell that this build is awesome, thoughtful, and annoying. The only way it could be made more annoying is by making an ‘E-word’ alarm, but there are ways around that. These images may look the same, but if you peer closely at the one on the left you’ll notice the eyes staring back at you. It seems animatronic decor is in this year, and we think [Fjord Carver’s] talking Christmas tree is one of the better offerings. 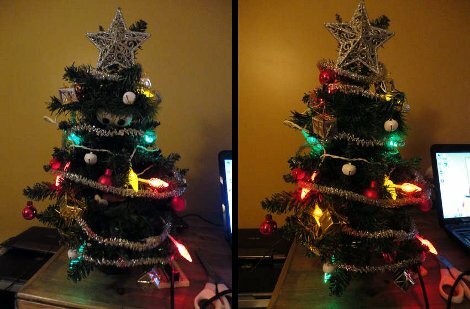 He picked up the diminutive tree at the dollar store, then started added the pieces that put on the show seen after the break. A small strand of battery operated lights, and a bit of garland are traditional. But the Arduino and pair of servo motors are a new holiday tradition. They move parts of the tree to reveal a set of eyes and animate a mouth. He drives the display by sending serial commands from a computer to the Arduino. This way you can script your performances, with flapping jaw, moving eyelids, and blinking lights while the computer supplies the sound. Is it just us, or does anyone else really want to see this guy singing the Chipmunk’s Christmas Song? Or if that’s a bit too wholesome you could go the more vulgar route. 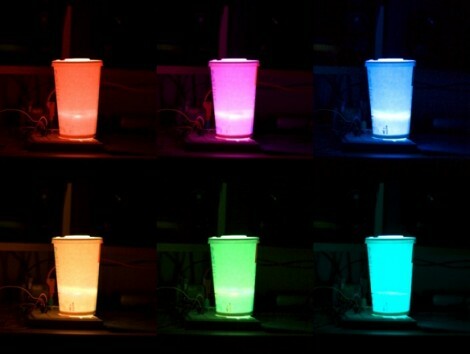 This LED lamp, which uses a soda cup as a lampshade, is Internet enabled thanks to a Linux board (translated). To say the system is overpowered would be a gross understatement. But at least there’s plenty of room for growth. The lamp is really just a hardware extension for the Linux board. A half-dozen colored LEDs are driven by an ATmega8 and a few transistors. A Fox LX832 board pushes color instructions to the microcontroller via the i2c protocol. [Gibus] chose this board because it has a built-in Ethernet port which makes it perfect for communicating via a smart phone browser. This is where the majority of the work on the project happened. He coded a Flash application that lets you select color, hue, and saturation data from any device that doesn’t run iOS. These commands are processed by a C application running on the Linux board. See a demo of the web app, and the resulting color changes in the clip after the break. Guess where this guy’s headed in his suit of many colors? If you said Burning Man give your self a pat on the back. After making a half-hearted EL suit for the festival in 2010 [Sander] decided he needed to step it up this year. 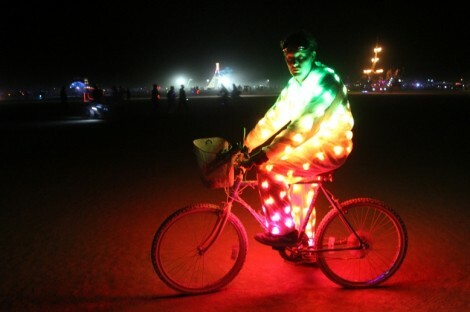 He bought and affixed 200 LED modules to this suit so that he could light up the night. They’re mounted in a grid, and in order to keep the changing patterns orderly he mapped the physical location of each in his code using a two-dimensional array. The controller uses an Arduino nano to push the patterns out to the array via SPI. [Sander] included several different visual effects for the controller. One strobes the suit starting from the right cuff when he shakes someone’s hand. There’s also an audio spectrum analyzer chip and microphone that let him pulse the lights to music. You can see how bright this thing is in the image above, but to get the full effect shouldn’t skip the video after the break. He’s entered the project into the Full Spectrum Laser Cutter giveaway. If he wins, we expect laser cut goodness for next year’s festival!